“Give me liberty or give me death” is a statement made famous by Patrick Henry but could easily have been stated by the new patriot of justice, Julian Assange. In December 2011, WikiLeaks released the documents from a database containing hundreds of documents from contractors in what WikiLeaks calls the “mass surveillance industry.” or "Spy Files". 1.) According to Spy Files released by WikiLeaks, intelligence agencies, military forces and police authorities "silently... and secretly intercepted calls and had taken over computers without the help of telecommunication providers", and tracked the physical location of mobile phone users, even when their devices were only on standby. 2.) Mass interception of entire populations is not only a reality, it is a secret new industry spanning 25 countries, according to WikiLeaks founder Julian Assange. These countries include India, US, UK, Brazil, Canada, China, Colombia, Czech Republic, Denmark, France, Germany, Hungary, Israel, Italy, Netherlands, New Zealand, Poland, South Africa, Switzerland, Turkey and Ukraine. 3.) There are three Indian companies in the WikiLeaks list of surveillance companies. These are Shogi Communications, ClearTrail and Shield Security. 4.) According to Assange, international surveillance companies are based in the more technologically sophisticated countries, and they sell their technology on to every country of the world.This industry is, in practice, unregulated and has some 160 companies. Some of the significant names include, BEA, Dialogic, Cambridge Consultants, HP, Siemens, Nice Systems, Nokia Siemens Networks and Thales. 5.) The CIA officials have bought software that allows them to match phone signals and voice prints instantly and pinpoint the specific identity and location of individuals. Intelligence Integration Systems, Inc, based in Massachusetts - sells a "location-based analytics" software called Geospatial Toolkit for this purpose.Another Massachusetts company named Netezza, which bought a copy of the software, allegedly reverse engineered the code and sold a hacked version to the Central Intelligence Agency for use in remotely piloted drone aircraft. Bravo Julian Assange. But, what can be said about the man that hasn’t already been said? More importantly, why are our political revolutionaries always persecuted by the government and hated by a certain number of self proclaimed moralists? 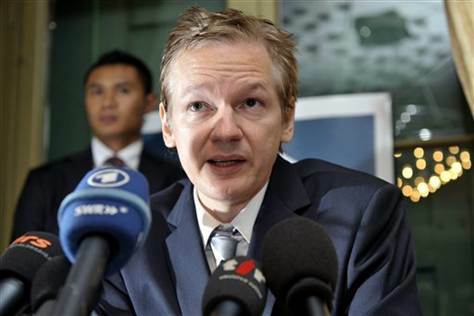 The assault on Assange for doing what is right by a wrong means. Let’s face it, moral change doesn’t come honestly. Immorality can only be combated by the same immoral means. In other words, in this case two wrongs make a right. It is wrong to release government documents, what is contained in those documents is wrong, therefore, exposing them is the right thing to do. Under his stoic demeanor there has to be a cauldron of fire that fuels his drive to deliver truth at all costs, by all means. It is hard to believe there are people who do not know Julian Assange but for their benefit, let’s look at the man behind our information revolution. One of THN’s favorite Assange quote is: “Capable, generous men do not create victims; they nurture victims.” We want the world to stop victimizing Assange and nurture the acts he does.Where would we be as a society without Julian Assange?